GALION — There is a saying that ‘everything old is new again.’ And for new Galion restaurant Bistro 217, that is certainly the case. The former Chris’ Big Plate Diner, owned by Scott and Lauri Armstrong, has some new owners. Steve and Holly Rose are moving the menu and atmosphere in a different direction. A husband and wife duo, Steve and Holly are not strangers to business or restaurant operations. For 16 years, Holly was a general manager and Steve a district manager for Pizza Hut. Having their own restaurant business has been a dream for them since then. A few years ago, the Roses left their positions with Pizza Hut to open The Roseberry House in uptown Galion. They were ready to branch out on their own in the small business setting, and the home decor, framing, and gifts atmosphere was a change of pace that was enjoyable for both Steve and Holly. Upon closing The Roseberry House store front earlier this year, The Roses continued to build and create items for a full schedule of craft shows this fall. All the while knowing what their long term plan was for their future. “Roseberry House was just a stepping stone to get us to this point,” said Holly. 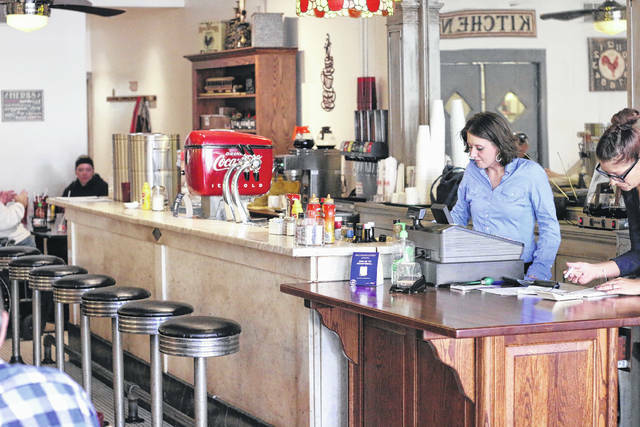 Up until a few days ago, many in Galion weren’t aware of the changes to the eatery. The Roses’ quietly took ownership of the restaurant on Nov 1st and continued to offer the menu for Chris’ Big Plate while they used up inventory for that menu that was purchased from the Armstrongs. Their new menu is now being served and offers a distinct difference in content from the previous one. Roses are also operating with different business hours to accommodate a dinner crowd. “We want to be the reason you don’t leave town for a meal,” Steve Rose said. And while Steve and Holly may be new faces in the restaurant space, all 10 employees who worked there previously for the Armstrongs stayed on staff for the changes. Roses consider that a huge blessing as they take on this new endeavour. A Grand Opening Celebration is planned the weekend of Dec.2 to coincide with the Come Home to Galion festivities. Bistro 217 will offer specials and discounts to introduce themselves to the community that weekend. Bistro 217, 217 Harding Way East, plans to offer carry-out meals for customers of Fox Winery and 1803 Taproom. They will also be carrying a selection of baked goods by Laura from Cake & Icing. Business hours are 7 a.m.-8 p.m. Sunday through Thursday and 7-9 p.m. Friday and Saturday. Employees at Galion’s new Bistro 217 on Harding Way East work to serve the breakfast crowd on Tuesday morning at the former Chris’ Big Plate Diner. New owners Steve and Holly Rose took ownership on November 1 and are hard at work to bring new tastes and availability to the restaurant. https://www.galioninquirer.com/wp-content/uploads/sites/38/2017/11/web1_IMG_5572.jpgEmployees at Galion’s new Bistro 217 on Harding Way East work to serve the breakfast crowd on Tuesday morning at the former Chris’ Big Plate Diner. New owners Steve and Holly Rose took ownership on November 1 and are hard at work to bring new tastes and availability to the restaurant.